[I] first encountered Pico de Gallo Salsa in southern California. An ex-pat friend took me out to a local Mexican place just off the Pacific Highway where we pulled up a stool at the bar, enjoyed several rounds of Margaritas and these warm lightly toasted nachos with an endlessly refilled bowl of fiery, fresh red and green salsa. This was a good five years ago, so you have to remember that the only salsa we tend to encounter in the UK, even now, comes in squeezy bottles or from Mexican kit meal packets and it’s really just a sickly version of tomato sauce with a bit of a kick to it. 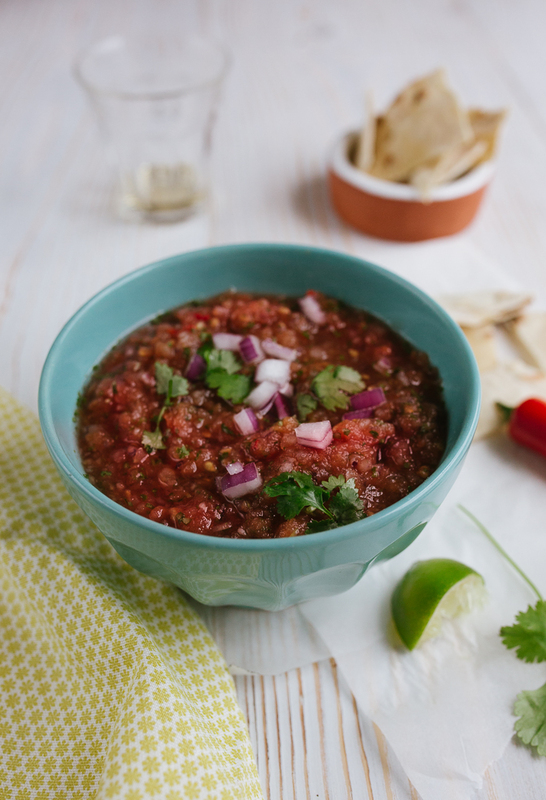 Good Pico de Gallo is a wondrous thing when made with completely fresh ingredients. 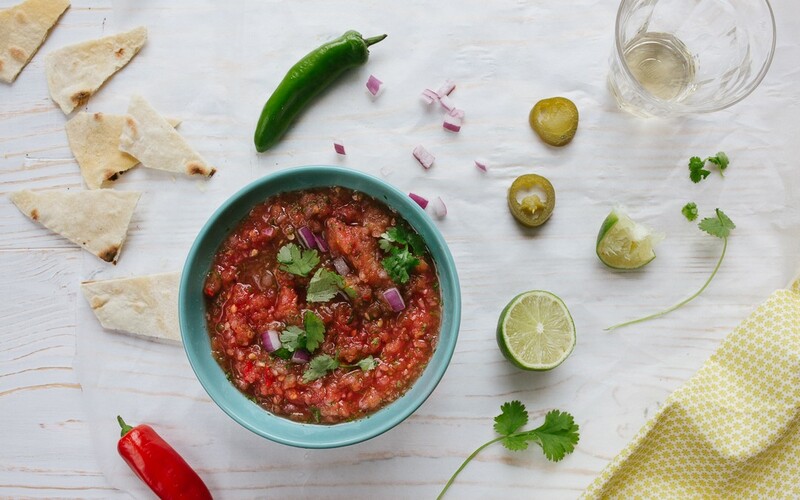 It actually took me another two years to discover what this heavenly salsa was called and how easy it is to make at home. In our house, it’s come to be known as weekend in a bowl. Nearly every Friday night, I make a big batch and we dip into with nachos and a beer with lime in the neck as a weekend treat and then we use it up in wraps and salads throughout the week. 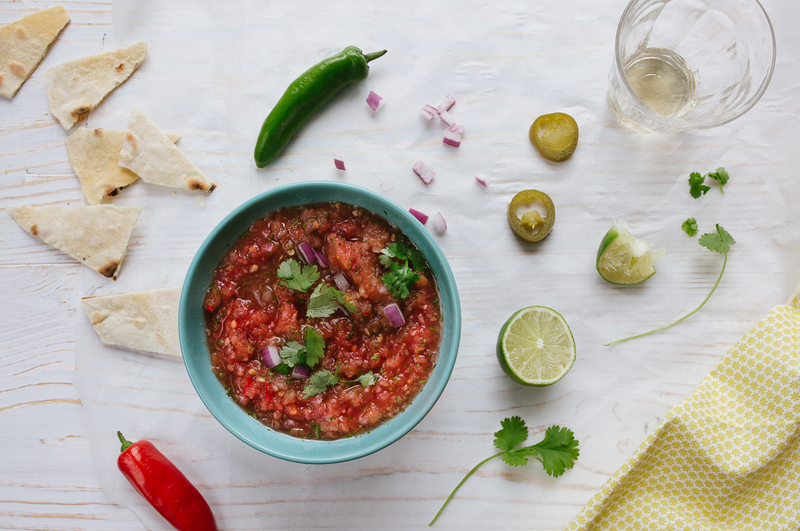 The consistency is looser than any salsa you might see in the supermarket (unless you live in California and can wander into Whole Foods or Trader Joes and pick up a bucket of it, you lucky things) and I have added my own little extras to the basic recipe. 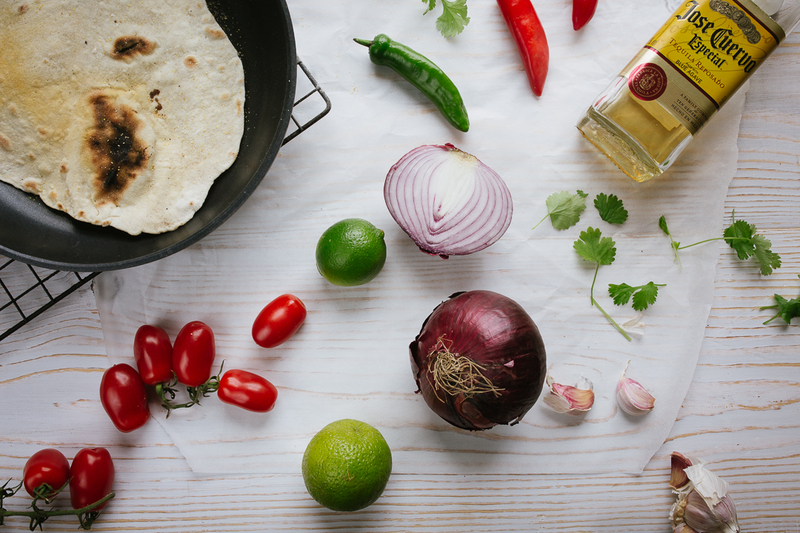 The key is to buy more limes and coriander than you think you will need because you’ll use it all! Bring a small saucepan of water to the boil and add the tomatoes and chilli pepper. Boil until the skins begin to split. Drain immediately and leave to cool. Slip the skins off the tomotoes and pat dry and squeeze any excess water from the chilli. In a food processor, add the tomatoes, chilli (with seeds if you like it hot), coriander, onion, Jalapeno peppers, shot of tequila and plenty of salt. Blend to your preferred consistency. We like ours quite fine. Add the lime juice and adjust the seasoning.